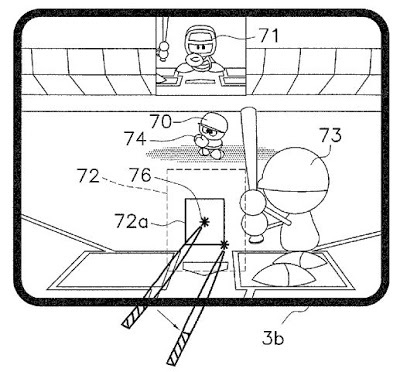 The ‘134 patent describes a baseball video game on a touch screen handheld system. A player can control the location, speed, and movement of the pitch. In traditional games, the movement and location of the ball is determined before the pitch is thrown. The player will select a location and a pitch, press the button and let it go. In this game, however, the location of the pitch is moveable until the pitcher has released the pitch. With a game implemented by the present game program, an expected pass display area of a ball will be displayed on a monitor between a dispatch position of the ball and a arrival position of the ball. When a dispatch operation of a pitcher character is initiated, the contact position of a command means in the expected pass display area will be identified if the command means is placed into contact with the expected pass display area. If the contact position is moved in the expected pass display area by the command means before a character has dispatched a moving object, the contact position after movement will be identified as the final contact position. When this occurs, a ball character will be dispatched from the pitcher character to the final contact position. 1. A computer readable medium storing a game program for causing a computer to implement a baseball video game in which a moving object being a ball of the baseball video game is dispatched from a pitcher character displayed on a touch panel type of monitor, the game program comprising: code for setting an expected pass display area of a moving object between a dispatch position of the moving object where the pitcher character exists and an arrival position of the moving object where a catcher character exists; code for initiating a dispatch operation of the pitcher character; code for identifying a contact position of input means in the expected pass display area where the input means is placed into contact with the expected pass display area of the monitor; code for allowing the contact position to be movable in the expected pass display area by the input means until the moving object is dispatched from the pitcher character, and changing movement speed of the contact position in the expected pass display area in response to the characteristics of the pitcher character; code for identifying the contact position after movement as a final contact position; and code for dispatching the moving object from the pitcher character to the final contact position.